You’ll probably do more text editing on your Samsung Galaxy Tab than you realize. The concepts are the same as you find on a computer, but without a keyboard and mouse, the process can be daunting. To move the cursor, simply touch the spot on the text where you want to move the cursor. To help your precision, a cursor tab appears below the text, as shown in the margin. You can move that tab with your finger to move the cursor around in the text. After you move the cursor, you can continue to type, use the Delete key to back up and erase, or paste in text copied from elsewhere. 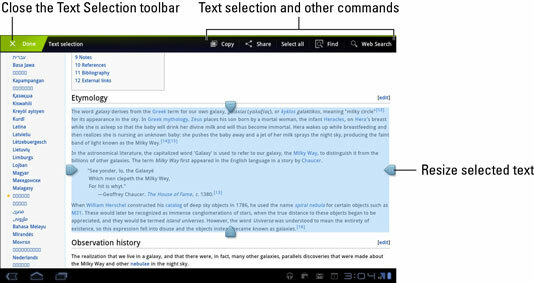 Selecting text on the Galaxy Tab works just like selecting text in a word processor: You mark the start and end of a block. That chunk of text appears highlighted on the screen. Text-selection starts by long-pressing a chunk of text. Sometimes you have to press for a while, but eventually you see the Text Selection toolbar appear on the top of the screen. You also see a chunk of text selected. 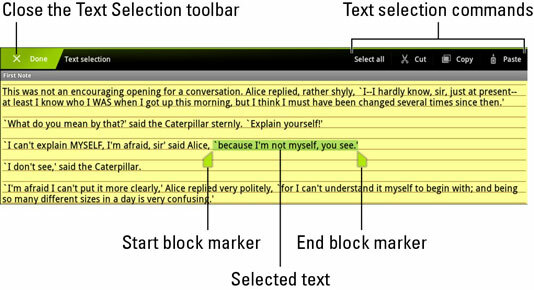 Drag the start and end markers around the touchscreen to define the block of selected text. Or you can touch the Select All command at the top of the screen to mark all the text as a single block. After you select the text, you can delete it by touching the Delete key on the keyboard, replace it by typing something new, or cut or copy the text. To cancel text selection, touch the Done button, or just touch anywhere on the touchscreen outside of the selected block. Seeing the onscreen keyboard is a good indication that you can edit and select text. Sometimes you may see a pop-up menu when you long-press text. If so, choose the Select Text command. You’ll then see the Text Selection toolbar and be able to select text on the screen. Long-press near the text you want to copy. The start and end block markers appear, as does the Text Selection toolbar: In addition to the Copy and Select All commands, there are Share, Find, and Web Search commands. Move the cursor tabs to mark the beginning and end of the block. If you move the tabs beyond a text region on the page, they disappear and are replaced by an area-selection tool. Use the four arrows to select a region of text on the web page. Choose Copy from the Text Selection toolbar. The text is copied into the Galaxy Tab clipboard. From there, it can be pasted into any app that accepts text input. The two other commands on the text-selection pop-up menu are Search and Share. Choose Search to look for text within the selected block. Choose the Share command to share the block as text or as an image via e-mail, instant message, Facebook, or any other sharing app installed on your Tab.